My vision for a redesigned sewing and craft space was in place and informed by the desire for a light and uncluttered space. 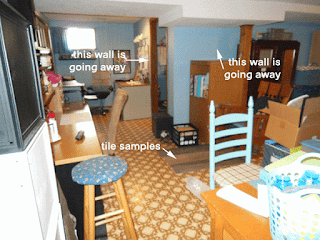 Removing walls and ceiling texture and paint color would do a lot to add light to the space. My next priority project was to work towards effecting an uncluttered space. 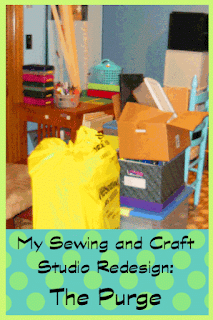 In order to achieve my vision for a light an uncluttered space for sewing, crafting, and writing, I would have to dramatically cut my storage. One reason was that I was eliminating two interior walls. One wall had my desk against it on the "outside." The other wall had my seven-foot sewing table on the "inside" and a six foot high bookshelf, a chifforobe, and a desk that I was using to hold my printer on the "outside." 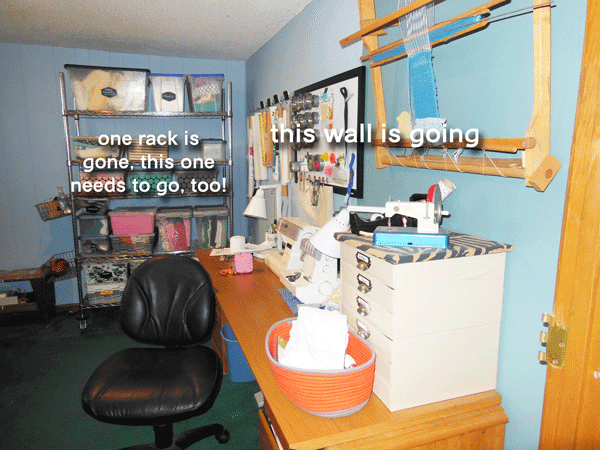 I also had two five-foot and one three-foot wide metal racks. There just wasn't going to be room for all this stuff! And that would mean eliminating much of the stuff it held. I estimated that I would have to reduce my storage needs by at least 50%. 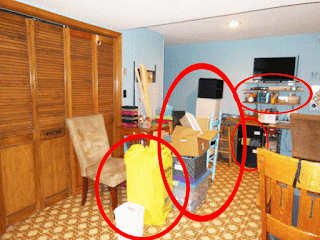 Now this didn't mean a purge of only the main spaces, but also a purge of the storage spaces. When we had the basement finished, it was made so that there is a storage space that contains the furnace and water heater and another space that is approximately 10' by 5'. In the "furnace" closet, I store the Christmas tree and all the Christmas decorations, luggage, a table-top weaving loom, folding chairs, coolers, and other even more miscellaneous things. In the other closet, I store kitchen stuff that isn't used often, pictures that are not currently being displayed, hardware, and memorabilia. 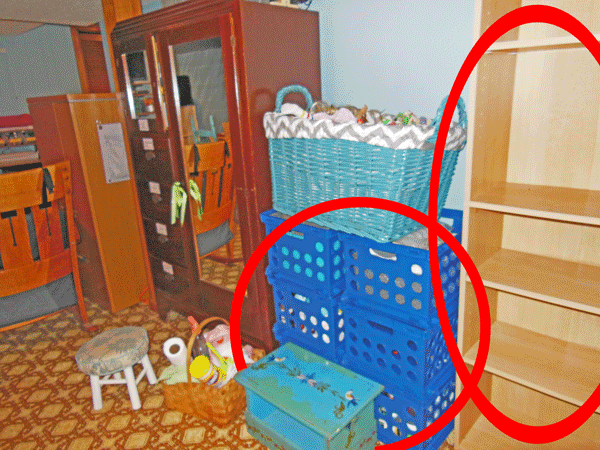 I realized that I would have to do some purging in these areas in order to make space for things that would have to be stored there from the main space. I wasn't able to eliminate a lot from the furnace area. I did remove a table I had put together using the top to my old drafting table and replace it with the butcher block table I had disassembled and was storing next to the refrigerator. Later, I reassembled the drafting table and donated it. I managed to remove a lot from the other space. It is a constant struggle to keep that space organized, since it is a natural dumping ground and I can close the doors on the mess. This time I was actually proud of my results! Just to be totally honest, you need to know that I had a lot of stuff just sitting on the floors. I had large foam board figures of Linus and Charlie Brown and two large cardboard camels (they were so cute!) leaning against the wall behind a storage rack. There was a stack of foam board leaning against another wall. All my framed artwork was on the floor of the storage area. There were bins and bins on the floor. 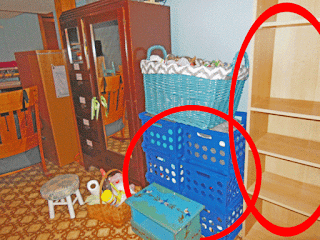 Items for donation and shelves that are coming down. Bookshelf was donated. Bins were used in the garage. I had my work cut out for me, and I made it my focus. I made three trips to the donation center with my RAV 4 packed with boxes and bags and small furniture. I put the bookshelf on the curb with a "Free" sign. It's amazing how quickly someone will come along who wants the things we put out with a sign. I was able to empty the three foot wire shelving and used it to replace an old metal shelf (also donated via the curb) in the storage closet. Our garbage pickup that week was bigger than post-Christmas trash piles. I pulled lots of craft stuff, including all of my stamping supplies. I originally thought I would sell some in lots through Facebook or Craig's List, but in the end I donated everything. I also donated a Pack n Play and some large pieces of fabric that were suitable for quilting to an organization that helps settle refugees and teaches refugee women to sew. I felt like the main character on an episode of Hoarders at times. There were things that I had been saving because I might use them some day. There were items were "perfectly good" and things that I had bought but had not got around to using yet. It got really hard to make decisions after a while. I actually found myself dithering about several of those sleeves that sheets come in. You probably toss yours right away. But I had saved them because they are made of the same fabric as the sheets they contained and I was sure they could be made into doll clothes. I really had a hard time deciding to toss those things! However, as soon as I let go of those and other things like that, I felt my soul and my mood get lighter. All that stuff I was saving to use someday—the fabric remnants that I had bought, never used, and no longer liked, the dozen metal coffee cans, and the two dozen empty Truvia jars—it was all a subtle mental and spiritual pressure. I let it go. One more thing about letting go. It just so happens that a few months ago I left the church of which I had been a member for nearly forty years. Often I was able to purge things that I had been saving for church projects. Letting these things go was a double release of a sort. I was letting go of the stuff and letting go of the past at the same time. It's funny how things work out like that sometimes. After a week of work, I was pleased with my results. I got to relax and enjoy my cleaner space over the weekend. The next week, Tom (TNDK Remodeling) asked how soon I could have all my stuff packed up and ready to move out. The remodel was about to begin!